There are eleven more ads today, from the June 19-25, 1999 issue of TV Guide Magazine, and from the June 21, 1999 Peach Section, in The Blade, plus one Random Pages gallery addition, a Monday, 6/21/99 Peach Section story by Chris Borrelli, "Channel 24 Sees Increase in News Ratings." 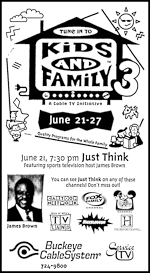 There's one addition, from The Blade's Peach Section, to the the Buckeye CableSystem gallery, a Monday, 6/21/99 ad for "Kids and Family 3" programming, including Just Think with James Brown, seen on Cartoon Network, Fox Family Channel, Disney Cha nnel, TV Land, Nickelodeon and History Channel. There's also one addition from that same Peach Section, to the ToledoVision 5 gallery, another 6/21/99 ad, for Indians and Reds games on TV5 and alternate channels. Next are eight additions, from TV Guide, to the Vintage Cable Ads gallery, starting with a full-page color Fox News Channel ad for Fox Report with Paula Zahn, followed by a full-p age color TNN ad, for their coverage of NASCAR's Winston Cup Pocono 500. 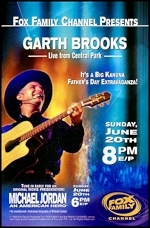 There's also a full-page color Fox Family Channel ad, for the movie, "Michael Jordan: An American Hero," followed by Garth Brooks Live from Central Park. Next are three full-page color "Kids and Family 3" ads, a Nickelodeon ad (20 years of putting kids first. How slime flies! 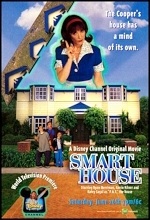 ), a Disney Channel ad for the movie, "Smart House" with Katey Sagal, and an HBO ad for Tama Janowitz's The Three Little Pigs, an animated special featuring the voices of Tyra Banks, Courteney Cox, Loretta Lynn, Sandra Oh, and Sinbad. There's also a Sunday, 6/20/99 ad for A&E's Biography of Brian Wilson, "A Beach Boy's Tale," followed by another 6/20/99 ad, for E! True Hollywood Story, "Farr ah Fawvett." Today's last ad, from TV Guide, is an addition to the Other Vintage ads gallery, a full-page color ad for Richard Karn's post Home Improvement book, "House Broken."